Strat HH version for Covered Humbuckers is also now available, just email me. Classic fantastic super mirror in real deal stainless steel. The guard does all the talking. Great with any knobs you choose. Polished to a very high mirror bling. Beautiful 100% non-magnetic stainless steel, corrosion free. FITS - Screw holes will fit any genuine Fender USA & MiM HH Strats from 1986 to present (before '86 there may be slight deviation in body screw hole placement). 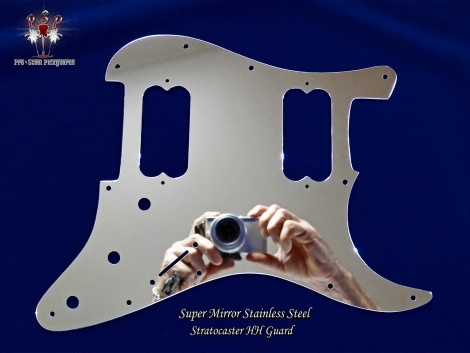 Or any Strat SSS when bridge & neck single coils are changed for humbuckers- American, Mexican, Standard, Classic, Hot Rod, Deluxe, Special, Lonestar, FSR, Power, Road Worn, Vintage Modified, Modern Player. If you have previously had a problem with a regular genuine Fender Strat guard fitting your guitar, see Downloads and print template to check fit.